Whilst most of us are rightfully concerned about the security of our homes, garden security isn't always a priority. We lock our doors and maybe windows, we fit burglar alarms, we have home insurance, but we tend to forget about the outside part of our properties. And yet many of us spend a fair amount of money not only on our gardens, but on the equipment and furnishings we store outside. If you've invested money in your garden, then you should be concerned with protecting it, which is why we're here to talk about garden security. You first step to securing your garden should be to ensure that you have appropriate insurance. That way if something does go wrong, you won't be out of pocket. If you have home insurance, chances are that at least some of the things in your garden will also be covered. However, you should definitely check your home insurance policy to confirm this. Also be aware that many insurance companies put limits on what is and isn't covered on your property. Items in sheds may be covered, whilst those just in the garden aren't. Or the contents of a shed might only be covered if the shed is locked. It's up to you to read the fine print and find out all the details. If you find that you don't have enough coverage, most companies will sell you an additional garden insurance policy for a small fee. Many people have sheds, greenhouses, bike stores, or other outbuildings on their property. All of these should have padlocks on the doors to prevent theft. 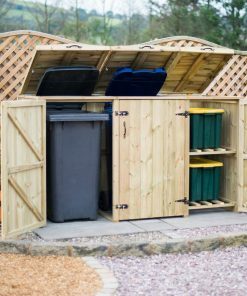 Remember that it's usually much easier for thieves to break into garden buildings than it is to break into a home, making places like sheds and bike stores popular targets. You might also consider installing window locks if they're appropriate. A relatively cheap padlock could end up saving you not only money, but also time and stress. And Don't Forget That Bin Store! Whilst a padlock on a shed might seem like common sense, not many people bother to put padlocks on bin stores. A bin store is a popular way to store wheelie bins, keeping them out of sight, but why lock the doors? Would someone really want to steal your rubbish? The answer to that is yes. Rooting through rubbish and recycling to find things like bank statements and official letters is a popular way to perform identity theft. By gaining the kind of information found in your rubbish bin, thieves can then access your bank accounts or credit cards, or even use your details to set up a credit card in your name (and you'll be responsible for the bill!). In today's world, the profits of identity theft can be much higher than the profits of mere housebreaking, so locking up your bin and recycling store is just a smart thing to do. Preventing access to your outside property through planting bushes, building a wall, or erecting a fence is a good first line of defence. However, don't think that just because you have a barrier that you're completely safe. You need to do regular checks to ensure that fences and walls are in good condition to prevent people climbing over them or even knocking them down. And any gates need to have solid locks on them too. Bushes aren't always an ideal barrier (though thorny ones could be), but better something than nothing. A casual thief may see bushes and wander away to somewhere more easily accessible. Here's a tip that you may not have thought of. For more expensive equipment such as large tools, or even bikes, it's worth having some kind of identifying mark. This could be an engraving or a carving, either of your name or postcode or something like that. The idea is that thieves prefer stealing things that they can easily sell on. Once you have an identifying mark on an item, that item then becomes much more difficult to get rid of. Plus, you're more likely to get something back if it is stolen if your name is on it. Okay, so a ladder generally isn't that expensive. You almost certainly have pricier equipment in your shed. Also, ladders tend to be bulky, so you might think that it'll be safe enough outside. However, ladders should always be stored in a locked place. This is quite simply because leaving ladders lying around just makes it all the easier for thieves to climb walls, or even break into your home through upper storey windows. Never leave ladders lying around. 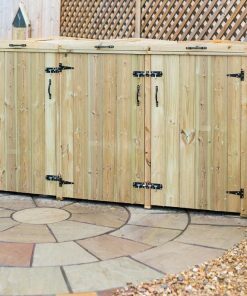 You probably only have a finite amount of storage space in your shed or garage, meaning some things might need to be left outside. If this is the case, make sure that you chain these things to a solid object. Chaining a bike or a spare ladder around a tree, for example, makes it that much harder to steal. On top of that there are some things that you want to remain outside, such as furniture or statues. The best thing to do here is to use an invisible pen (available from most gardening stores or online) to mark your information on the underside, and to take pictures just in case something is stolen to increase your chances of getting it back. If you're going away on holiday for a while, it's probably worth just bringing all the garden furnishings and statues inside and locking them up while you're gone. Making your garden as secure as possible doesn't take a lot of time or even a lot of money. It just requires you to remember that you've made an investment in your garden and need to ensure that that investment is protected. A few minutes here and there and a few pounds could prevent theft, worry, and financial loss.